I’m sharing this because I’m a HUGE fan of adopting, not breeding. The ONLY part I don’t agree with is the “outdoor” living part. A pet is a family member. They don’t get chained up outside nor set free to run wild among feline haters, nasty children and other much larger animals. I have rescued approximately 10 cats during my adulthood, 5 in which I still have. They live INSIDE, with ME, and sleep in a warm, safe atmosphere just like my kid does, because they too, are my children. My point however is ADOPT! There are so many unwanted animals out there that didn’t ask to be born or let alone be discarded because much of the human race is ignorant. Check your local shelters, do research. The feline rescue I use has us fill out applications and does home visits before hand. She’s thorough for a reason, because every cat she saves is now “family” to her until she can find their forever home. 3.4 million cats go into our nations shelters every year waiting to be adopted. Of those cats, approximately 1.4 million are euthanized. 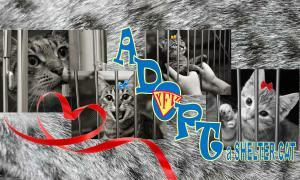 Instead of buying a cat, please go to your local shelter or ask your veterinarian about cats available for adoption. The issue with the number of cats in shelters begins with irresponsible pet owners that release their unaltered (not spayed or neutered) cats to their local area. An unsprayed female can produce one or two litters a year, with an average of 4 to 6 kittens per litter. This process can begin a young as four to six months old. Did you know the cost of spaying a cat is less than the cost of caring for a kitten in its first year?